When it comes to homeownership, home value is the name of the game, especially if you plan on moving in the next few years. While you are in your current home, it is important to undertake home improvement projects that not only improve curb appeal and functionality, but also home value. So what are the best projects in terms of ROI (return on investment)? But it’s summer. You can worry about the interior of your home when the weather cools down. You want a project that enhances your landscape. Well, what about a Patio? With an average ROI over 80%, according to Remodeling Magazine’s annual Cost vs. Value report, a new patio is an excellent investment. A patio is an attractive way to add outdoor living space to your home. This is the perfect home improvement project for homeowners who love to entertain. Your friends and family will love barbeques on your new patio. Because pavers come in all sorts of shapes, sizes, and colors, there are nearly limitless design options. If you have young children, a patio is a much safer option than a deck. Patios have an expected lifespan of 30 years or more if installed correctly. Freedom Fence and Home, the company you know and love for our fences and decks, also specializes in patio design and installation. And with more than 50 years of combined experience, we are the clear cut choice for the job. We not only stand behind our work, but we believe in customer service. 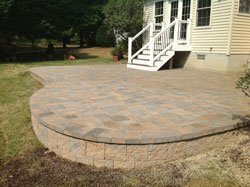 To us, your patio is not just another project; we treat your patio like it was our patio. Like any other company we need to make a profit to survive but focus on satisfying our customers. If you have any questions about the benefits of adding a Patio to your Bel Air home, please contact Freedom Fence and Home by calling 443-271-6841 or visit our website. You can also follow us on Facebook and Twitter! This entry was posted on Thursday, July 24th, 2014	at 7:40 pm	. Both comments and pings are currently closed.